Have you ever wondered if there is more that Spyware Terminator can do, or what some of the tabs and functions are for? 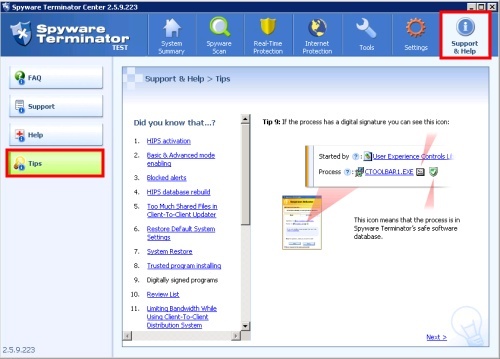 Now you can learn some useful tricks thanks to a new Spyware Terminator Tips tab in the Help & Support tab. Even though Spyware Terminator no longer supports Windows 2000, we've adjusted the Real-Time Shield to allow users of this operating system to use this powerful antispyware feature. Try Out Spyware Terminator 2.5.9.223! Download this newest version of Spyware Terminator and try it out! If you like it, don't hesitate to recommend it to your friends or promote Spyware Terminator to other users to help them protect their computers from spyware, adware and other malware threats.